ON THE DECLINE IN POPULATION. Kaumualii’s mahiole fetches a mere $120 at auction, 1873. Antiquities of Hawaii nei.—At 10 o’clock in the morning of this past Saturday, Mar. 8, the valuables of old Hawaii which were advertised earlier were auctioned off by E. P. Adams. The house was filled with all sorts of people, and some objects went for high bids. The feather mahiole of Kaumualii went for the price of $120. This headdress went for a very low price; it is believed that never again will there be available a mahiole of that kind. The care given to all of the objects by the mother who has passed [Mrs. Whitney] was very good. Ka Nupepa Kuokoa, Buke XII, Helu 12, Aoao 3. Maraki 22, 1873. On Kaumualii and Kaahumanu, 1880. Kaahumanu was one of them who made a circuit of Maui, Oahu, and Kauai with Liholiho. When Kaahumanu arrived on Kauai, she took Kaumualii, the alii of Kauai, as a kane [husband] for herself. When Liholiho returned to Oahu, it was with Haakulou, the woman of Kaumualii; because Liholiho took Haakulou as a wahine [wife] for himself, along with his other wahine. Kaahumanu lived on Kauai along with Kaumualii in the year 1822. Perhaps in the month of August. 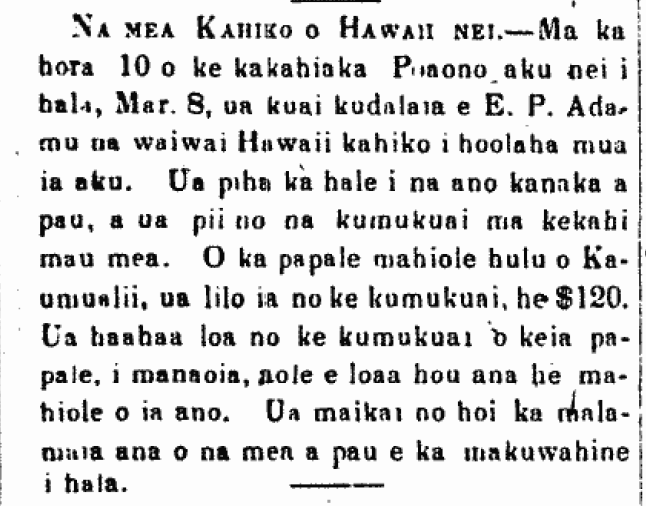 The name of Kaumualii’s mahiole, 1906. After these words of Kamehameha’s were over, he then took his mahiole, Koki, from a basket and placed it upon the head of Kaumualii. Kamehameha removed his royal malo and so too did Kaumualii remove his malo, and they exchanged them with each other. [This account is from the meeting of Kamehameha and Kaumualii. It is just a tiny excerpt of the kind of awesome information available in the story of Kamehameha I translated by Kamaoli Kuwada, Emalani Case, and Beau Bassett, slated to come out from Kamehameha Publishing. I can’t wait. Ka Na’i Aupuni, Buke II, Helu 88, Aoao 1. Sepatemaba 14, 1906.